So in our kitchen we had the original wall-mount telephone jack. Straight from 1960, it even has the Bell logo on it. Talking to my mother and aunt about it before, they mentioned that there was always the kitchen phone when they were growing up – a big boxy rotary phone – and it was the only phone they could use. 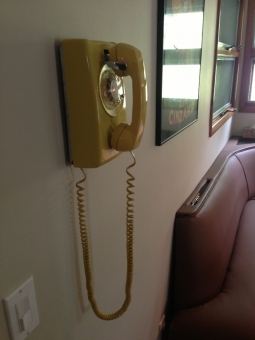 The only other phone was in my Grandparent’s bedroom. I even recall it there when I was a kid. By the late 1980’s it had been switched out for a cordless phone, and when we moved in a cheap white corded phone was hanging there. But of course with no landline, this would just be for show. I wanted to correct this, though. After doing some research I figured out that I could do more – much more in fact. I got to thinking about how it would be great if I could still actually use these phones around the house. Given that our cell phones have bluetooth, surely there must be a way to link all of this together? It turns out there is. A little bit of research led me to purchase an Xlink BTTN “Bluetooth Cellular Gateway” – this is basically a device that, when your cell phone is in the house, uses Bluetooth to connect the box to your cell phone. When someone calls your cell phone, it rings any phones (like your home ones) connected to it. You just pick up any phone to answer. Another call comes in? It supports Call Waiting. Have a Caller ID phone? It will send the Caller ID to the phone. It links three separate cell phones to the device and can juggle them. Oh – if you have an iPhone, you can pick up any handset, dial ## and use Siri too. It’s pretty spectacular. The only real limitation is that Bluetooth only works within about 15 feet, so you have to leave your cell phone near the device. I don’t want this limitation, so I’ve ordered an external antenna and am going to hack the device to enhance the Bluetooth range. But now for us, the bottom line is that when someone calls us on our cell phones, we don’t have to run across the house to figure out who it is – the kitchen phone rings (with it’s awesome bell ringer), and our cordless phones get Caller ID identifying not just the number but (if the person is in our phone book) the name of the contact as well. We can literally grab any phone to take the call. This entry was posted in rambling on May 25, 2013 by Douglas Camin. That’s a great idea to make an old phone not just decorative but functional as well. If my phone jacks were in more useful places I’d add this to the list of ideas I’m “borrowing” from you. That device is pretty sweet. I was looking into a lot of home automation stuff myself, specifically for our exterior lights since we often forget to turn them off when it’s daylight and come back when it’s dark. I came across this whole line of devices for automating various functions (including the garage door) within your house called Insteon. There are several whole-house automation setups out there but they are usually lots of money – this one you can get in to for about $300 (the base hub and some outlets\switches) and then expand it as needed. No additional wiring needed and it links to an iPhone or Android device. I’m going to be implementing this at some point around here too. Nice finds. I went the simple route for turing on and off my outside lights. I just got daylight photocell sensors that screw in between the socket and the bulb. Cheap and work like a charm. I got the idea from a light post in my backyard that had a more elaborate vintage one built into it. Haha…that’s funny. In my quest for a fancy solution, I never even gave a second thought to getting a simple photocell sensor and leaving the switch turned on. I replaced all the exterior bulbs (60 watts) with 11.5 watt LEDs and in total they use 57.5 watts so leaving them on all night is no issue. I may just do this instead for those lights. By the way – did you see my post on your blog about considering going solar? For your all-electric house I bet you could reap some nice return on investment.